There are so many advantages to making your own sausage. Store bought brands are loaded with preservatives. I’ve been able to find nice locally processed brands that use locally raised meats, but they are quite expensive. I like to save that sort of splurge for my indulgence meals. If you make your own, you can choose your meat (pork, chicken, turkey, beef), you can choose your seasonings (Asian, Mexican, Italian), and you can control the spice level. Perhaps the best advantage is that you control the processing (in your own, clean kitchen), and you control the ingredients with no chemical preservatives. First, choose your meat. I chose chicken. I think dark meat works best. It has more flavor, and a nicer fat ratio, which is important. I like to trim off about half the fat. In the professional kitchen, we have nice cutting boards that are color coded for meat, vegetables, and fish. We also have very hot water for washing, as well as sanitizing chemicals. In my home kitchen, I like to cut up my meat on a glass plate, if possible. It’s much easier to clean than a plastic or wooden cutting board. I also have a special pair of scissors that I use for cutting and trimming fat off of meat. I will certainly use a sharp knife if I’m cutting expensive steaks. For sausage production, however, the scissors are easy to clean, and eliminate raw meat on a cutting board. I trim the meat into medium to large dice. I then add any spices I like. In this particular batch, I made Asian flavored chicken sausage meatballs which I put into a rice noodle soup. My seasonings consisted of fresh garlic, soy sauce, salt, pepper, chopped jalapeno, and chinese five spice powder. 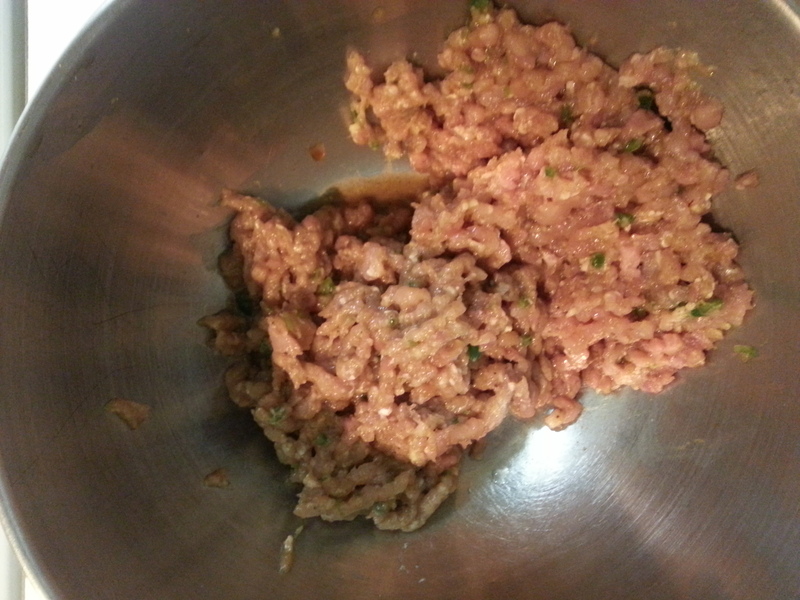 After mixing the seasonings in with the meat, I let the mixture sit at room temperature for about 15 minutes. I have this cool, handy, meat grinding attachment that fits on to my Kitchen Aid mixer. It cost me a bit less than $100, and I think it was well worth the investment. If you don’t have a Kitchen Aid, or you don’t want to invest in the meat grinding attachment, you can grind your meat by pulsing it in your food processor. I feed the meat mixture through twice. At this point, you can wrap and freeze the sausage for future use. You can spread the sausage on a sheet pan, and cook it in the oven. You can brown it in a skillet on the stove. You can wrap it tightly in plastic wrap, forming it into a cylinder and drop it in poaching water. You can form meatballs and drop them right into a pot of simmering soup or stew. The sky’s the limit! Make your own combination today! This entry was posted in Uncategorized on May 2, 2013 by Katie Fiore. looks fantastic! We made some tempeh sausage a while back… also pretty tasty. Hope y’all are doing well! Thanks Eric! I hope you are well. I’ve seen pics of your little one – pretty cute!